The pursuit of global mobility in a world divided up into nations invokes a fundamental dilemma. Free passage without harassment is a right we routinely expect to exercise whenever we travel abroad. Yet the right of people within a country to determine who enters their nation is enshrined in law. This unresolvable tension between sovereignty and mobility catches international students in its grip. More than 4.5m students cross borders every year for educational purposes, mostly entering English-speaking countries, Western Europe, China, Japan and Russia. The great majority of these students return home when their education ends, though some become skilled migrants to the country of education, or other countries. Nations compete for international students – every country wants high-quality research students and some make a profit from international undergraduate and masters-level students. In the UK, for example, Universities UK reported that international students spent £4.4 billion on fees and accommodation in 2011-12. However, education policy is all too often in tension with migration policy. The United States (after September 11, 2001), Australia (in 2010-2011) and the United Kingdom (now) have all slowed down their student intake because of security concerns, or local opposition to migration. In each case numbers fell sharply and stayed down. Change in number of foreign students. Make your visas more expensive than the competition. Currently, UK visas are at the top end of costs among the principal education exporting countries. It costs £322 to apply for a Tier 4 (General) student visa from outside the UK. Slow down the time for visa processing, so education agents push families to choose competitor countries. This happened in Australia in 2011 in relation to Chinese students – families went to the US. The visa rules were relaxed and the numbers picked up again. Ensure that universities and colleges not only charge high tuition fees, but require families to bank a full year of living cost support for several months before enrolment begins, as the UK does at present. Use a discriminatory policy against students from major countries such as India or China, or better still, whole regions such as the Middle East. Subject those students, and not others, to extra checks at entry and extra reporting requirements. Ask their universities to spy on them and regularly report to immigration authorities – as with the Patriot Act under George W Bush in the US, and as the UK does in relation to non-EU students at present. Allow the local media to mount sustained attacks on international students as a group for destroying the national way of life, or triggering an urban crime wave, or consuming fast foods with strange smells in city precincts, or being dangerous drivers. This happened in New Zealand 12 years ago and the Chinese government advised families not to send their student children to New Zealand. Numbers dropped like a stone. Restrict work rights during study and, better still, impose a blanket ban on international students working during vacations, so students cannot earn the money they need to cover their fees and living costs. Both the UK and Australia limit working time. The UK is planning to introduce this for international students from outside the EU. Send lightning raids into workplaces in case international students are working more than their maximum weekly hours – and deport them on the spot if they do. Australia used to do this. Make it hard for international students to open a bank account without a place of residence and impossible to rent an apartment without a bank account – which happens in the UK. Do the same with mobile phone contracts. Make it expensive to be covered by medical insurance (as it is in Australia), visit a doctor or access hospitals and other emergency services. Restrict the rights of students to stay and work once they have graduated. This is crucial, as students who want to migrate need work rights to build the bridge to migration, and others need work to pay back their loans. The UK used to encourage students to work for two years after graduation, but in 2012 the policy changed so that a graduate had just four months to get a job worth £24,000 or more a year in their field of training. The number of visas given to former students in the UK declined from a peak of 43,319 in 2011, to 557 in 2013. The UK is now planning to force graduates to leave the UK before applying for graduate jobs, which will make it even harder for them to stay. Highly skilled graduates will go elsewhere. International students are the collateral damage of migration politics. Cutting temporary migration by students is the easiest way to reduce the number of people coming in to a country, even though most students never become permanent migrants. In the UK it will probably get worse before it gets better. The home secretary, Theresa May, says that high migration is a threat to national cohesion and higher education institutions must be prepared for a drop in international student numbers. But if the UK government follows May down the migration-bashing route and bears down harder on international student entry and graduate work rights, that is not a recipe for a wobble in the market, but the ongoing loss of a chunk of market share. 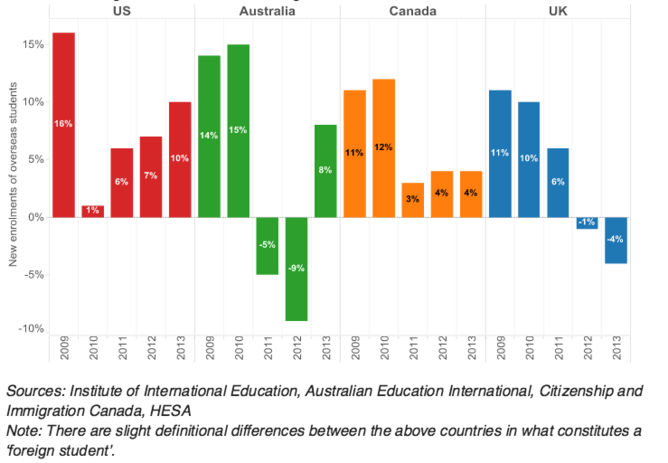 Evidence from the US in the wake of the 2001 Patriot Act, and Australia after its slowing of visas and noncompetitive work rights in 2010-2011 suggest that when student numbers fall, the downturn lasts for years, and lingers even after policies reverse again. But the major problem for the UK is the timing. Different countries have to face popular resistance to migration, but those moments do not always coincide. While the UK government is talking about massive cuts to migration, it so happens that the US, Canada, Australia, China, Japan and Germany are stepping up efforts to attract international students. Growth is surging in the US and Australia. Both countries have learned from past mistakes and are being careful to avoid the ten “dont’s” on this list. This article was originally published on The Conversation. Read the original article. The Conversation’s international teams are collaborating on a series of articles about the Globalisation of Higher Education, examining how universities are changing in an increasingly globalised world. This is the second article in the series. Read more here. This is such a well-thought out article. UK’s rather stringent migration laws have always made it difficult for students to get a job- especially since the students cannot even apply for jobs unless they have a valid work permit. It’s a catch-22 situation that is driving highly qualified students away. This is a move that can cause the country billions of pounds, and a lot of potential development as well.